There are 7 different notes in the scale. When the scale is played, the first note is usually repeated at the end, one octave higher. In this case, that’s the note F#. This kind of “rounds off” the scale, and makes it sound complete. Therefore, the final F# will sometimes be included in examples and diagrams, depending on the situation. You may have noticed that the 7th degree of the scale is the relatively uncommon note E#. Even though E# is just another name for the note F (as we learned in the lesson on enharmonics), it’s important in this case to call the note E#, not F. This is because we already have an F note in the scale, F#, and we can’t have an F# and an F natural in the same major scale. Every degree of the scale gets its own letter, and its own space or line on the staff. This way we can quickly recognize which degree of the scale we’re looking at on a piece of music, at a glance. It would be much more confusing if two of the scale degrees shared the same exact line or space! The F sharp major scale contains 6 sharps: F#, G#, A#, C#, D#, and E#. The scale of a piece of music is usually indicated by a key signature, a symbol that flattens or sharpens specific lines or spaces on the staff. Instead of putting a sharp symbol next to every single F, G, A, C, D, and E notes, it’s much easier to just place a key signature at the beginning of the music, which automatically sharps every F, G, A, C, D, and E, so that the music conforms to the F sharp scale. The lower tetrachord of F sharp major is made up of the notes F#, G#, A#, and B. The upper tetrachord is made up of the notes C#, D#, E#, and F#. 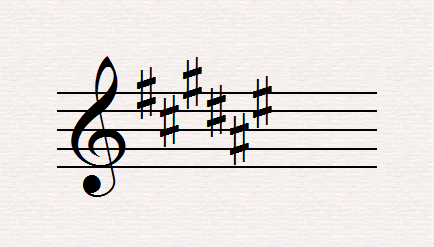 What scale degree is the note A# in the F sharp major scale? Which note is the 5th degree of the F sharp major scale? Which note is the 2nd degree of the F sharp major scale? How many sharps/flats are there in the key of F sharp major? How many white keys are in the F sharp major scale? Which note is LA in the F sharp major scale? What is the solfege syllable for E# in the F sharp major scale? Is the note B part of the upper or lower tetrachord of an F sharp major scale? Which note is the mediant scale degree of an F sharp major scale?